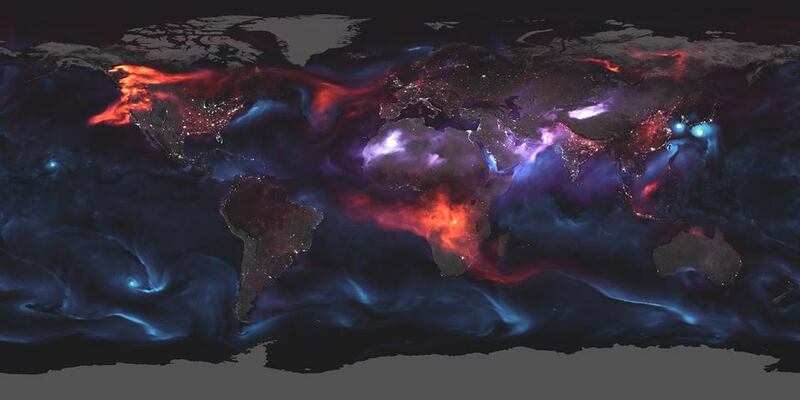 The visualization above highlights NASA Earth satellite data showing aerosols on August 23, 2018. On that day, huge plumes of smoke drifted over North America and Africa, three different tropical cyclones churned in the Pacific Ocean, and large clouds of dust blew over deserts in Africa and Asia. The storms are visible within giant swirls of sea salt aerosol (blue), which winds loft into the air as part of sea spray. Black carbon particles (red) are among the particles emitted by fires; vehicle and factory emissions are another common source. Particles the model classified as dust are shown in purple. The visualization includes a layer of night light data collected by the day-night band of the Visible Infrared Imaging Radiometer Suite (VIIRS) on Suomi NPP that shows the locations of towns and cities. Aerosol data by NASA. Red means: Carbon emissions. Blue means: Sea Salt. Purple means: Dust particles. As of today, Sharp’s post has collected some 281 notes, and almost all of them have “liked” it. NASA commits an error of omission. Dr. Sharp compounds it with an error of commission. Let’s see how. NASA does find it important to mention that the man-made sources of carbon are “common.” However, the statement is ambiguous, perhaps deliberately so. It curiously omits to mention that the quantity of such “common” sources is so small that there is no choice but to regard it as “not critical.” We may not be in a position to call the “common” part an error of commission. But not explaining that the man-made sources play negligible (even vanishingly small) role in Global Warming, is sure an error of omission on NASA’s part. If I were to have an SE/TE student, I would assign a simple Python script to do a histogram and/or compute the densities of red pixels and have them juxtaposed with areas of high urban population/factory density. BTW, I am only too well aware of the ugly political wars being waged by a lot of people in this area (of Global Warming). Since I do appreciate Dr. Sharp’s blog, I would be willing to delete all references to her writing from this post. However, I am going to keep NASA’s description and the photo intact. It serves as a good example of how a good visualization can help in properly apprehending big data. In case I delete references to Sharp’s blog, I will simply add another passage on my own, bringing out how man-made emissions are not the real cause for concern. But, regardless of it all (related to Global Warming and its politics), this picture does serve to highlight a very important point: the undeniable strength of a good visualization. Yes I do find that, in a proper context, a picture is worth a thousand words. The obvious validity of this conclusion is not affected by Aristotle’s erroneous epistemology, in particular, his wrong assertion that man thinks in terms of “images.” No, he does not. So, sure, a picture is not an argument, as Peikoff argued in the late 90s (without using pictures, I believe). If Peikoff’s statement is taken in its context, you would agree with it, too. But for a great variety of useful contexts, as the one above, I do think that a picture is worth a thousand words. Without such being the case, a post like this wouldn’t have been possible. However, unfortunately, he does not give the name of the original composer. It is: Bertha Egnos (apparently, a white woman from South Africa [^]). Listen to Korbosha and to this song, once again. You will sure find that it is far more than “mere few initial bars.” On the contrary, except for a minor twist here or there (and that too only in some parts of the “antaraa”/stanza), Burman’s song is almost completely lifted from Egnos’s, as far as the tune goes. And the tune is one of the most basic—and crucial—elements of a song, perhaps the most crucial one. However, what Burman does here is to “customize” this song to “suit the Indian road conditions tastes.” This task also can be demanding; doing it right takes a very skillful and sensitive composer, and R. D. certainly shows his talents in this regard, too, here. Further, Asha not only makes it “totally, like, totally” Indian, she also adds a personal chutzpah. The combination of Egnos, RD and Asha is awesome. If the Indian reader’s “pride” got hurt: For a reverse situation of “phoreenn” people customizing our songs, go see how well Paul Mauriat does it. One final word: The video here is not recommended. It looks (and is!) too gaudy. So, even if you download a YouTube video, I recommend that you search for good Open Source tools and use it to extract just the audio track from this video. … If you are not well conversant with the music software, then Audacity would confuse you. However, as far as just converting MP4 to MP3 is concerned, VLC works just as great; use the menu: Media \ Convert/Save. This menu command works independently of the song playing in the “main” VLC window. Bye for now… Some editing could be done later on. This entry was tagged Americans, Bad, Big Data, Epistemology, Fluid Mechanics, Global Warming, psycho-epistemology, Visualization. Bookmark the permalink.